Another New York Comic Con has come and gone, and that means cool trailers, rad panels, and great cosplay has come and gone with it. 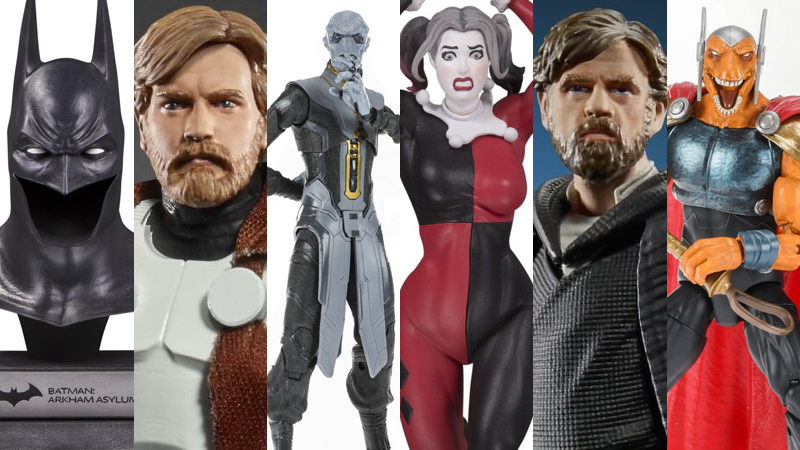 But we can still look forward to all the shiny new toys and collectibles revealed at this year’s convention—so here’s our favorite pickings from what’s to come in the world of Star Wars, Marvel, and DC toys fresh from the Javits Center. Another day, another Bat-specific line of DC collectibles. This time the DC is expanding its Gallery line of replicas with all new 1:2 recreations of iconic Batman masks from across the many mediums the Dark Knight has dabbled in over the years. Costing $90 apiece and launching in summer 2019, the collection will first kick off with a model based on Batman’s cowl in his ongoing DC Rebirth series, followed shortly by another based on the long-eared design seen in Rocksteady’s Batman: Arkham video game franchise. DC’s range of iconic interpretations of its comic book characters in the 7-inch scale is getting expanded with four new figures. Ahead of Wonder Woman 1984, there’s comic book versions of Wonder Woman and Cheetah, and then Supergirl and the classic Cyborg Superman will join the line in June 2019, for $26 apiece. Finally, DC announced some Batman and Batman-adjacent additions to its statue range, all inspired by recent comics. Frank Cho’s red, white, and black variant cover for Harley Quinn #50, inspired by an iconic Batman ‘66 moment, will get her own statue, as will a black-and-white rendition of Sean Murphy’s take on the Joker in Batman Black and White: White Knight. They’ll be joined by the Merciless, one of the evil Batmen seen in the sprawling Dark Nights: Metal event series last year. They’re all releasing in June, with Harley and Joker costing $80, and the Merciless costing $85. Hasbro’s 6-inch-scaled Star Wars figures had a big showing at the con, kicking off with two Clone Wars-era additions to the line. One depicts Obi-Wan Kenobi in a melding of Jedi and Clone armor like the gear he wore in the original Clone Wars animated series; it’s exclusive to Walgreens and releases next fall. That means there’s plenty of time for the gorgeous, multi-armed General Grievous that’s coming in spring 2019 to gear up to fight him. Speaking of exclusives, Target and Gamestop will be getting one each in spring: Target gets Luke Skywalker, in his A New Hope-era Stormtrooper disguise (post trash compacter encounter, hence the additional muck); while Gamestop appropriately gets a gaming-themed addition: the Imperial Rocket Trooper, as seen in Star Wars: Battlefront II. The summer wave of 2019 has three very fun arrivals for Star Wars comic fans. After they lit up the Vintage Collection scale earlier this year as an San Diego Comic-Con exclusive, the icons of the first Darth Vader Marvel series (and stars of their own book since)—archaeologist Doctor Aphra and her homicidal droid accomplices BT and Triple Zero—will be stepping up in size to join the Black Series line. But NYCC was really the Vintage Collection’s time to shine, with a ton of new looks at returning figures (and new recreations) coming to the revitalized 3.75-inch line. Spring 2019 brings with it a host of figures presumably inspired by the gigantic, crowd-funded Jabba’s Sailbarge toy set to release in February. Saelt-Marae (aka Yakface), Leia in her Boushh disguise, Klaatu, and the deluxe Gamorrean Guard (which will be a shared exclusively at certain fan sites) are all perfect additions to Barge, if you have the space and wallet to have backed the project. If you were looking for something a little less themed, there’ll also be three other Vintage figures launching around the same time. In the wave there’s a Scarif trooper from Rogue One, and then two exclusives: Target will get a Han Solo in Stormtrooper disguise, while select fan websites will get a 41st Elite Corps Clone Trooper. If all that wasn’t enough, Hasbro offered two intriguing teases for the summer wave for the Vintage Collection. First up is a normal release of the Rogue One Assault Tank driver figure currently available with actual vehicle playset, but the second is a very exciting addition...the legendary Luke Skywalker, as he appeared in his force-projected idealized self on Crait to make his last stand in The Last Jedi. We might all have moved on to wildly speculating about the title of Avengers 4, but Hasbro is still putting out some Infinity War-themed toys, namely in the form of two more members of Thanos’ Black Order, completing the quartet in the Marvel Legends line: Corvus Glaive and Ebony Maw are due to release sometime in 2019...presumably juuust in time to start hyping up Avengers 4. Meanwhile, back in the land of comics-based toys, Hasbro will release another round of X-Men figures in spring. Forge was revealed as the latest addition to the wave, as was the build-a-figure bonus for collecting every figure in the wave: the mutant-sensing Morlock, Caliban. Spring will also see the release of another wave of Spider-Man-themed figures—after all, Spider-Man: Far From Home will be on the way!—which will add Night Thrasher to its ranks. And then, for good measure, there’s also going to be a very cool looking Beta Ray Bill, too. Hasbro also revealed some plus-sized deluxe sets. Two previously revealed vehicle-based additions—Deadpool on his scooter, and Professor X in his chunky, ginormous floating hoverchair—were confirmed for spring, as were a pair of two-pack figure sets. One contains Kraven and the black-suited Spider-Man, and another is inspired by the absolutely terrible 2017 comic event Secret Empire, pairing Arnim Zola with the armored up “Hydra Supreme” version of Captain America. Action figures weren’t the only Marvel goods Hasbro brought to New York: They also announced a new wave of...Chimichangas? Well, specifically, Chimichanga Surprises, little collectible Deadpool-themed bling bags that come with a tiny Deadpool toy and a sticker. Perfectly pocket sized so that kids who should absolutely not be reading Deadpool comics can totally annoy their parents at checkout lines for one, the new wave launches in spring, and includes everyone from Santa Deadpool to Lady Deadpool to Pirate Deadpool—and there’s even X-Force related variants to collect!